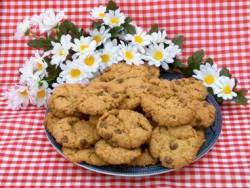 For those of you that are on a wheat-free diet, here is a tasty chocolate chip cookie recipe for you to try. Combine rice flour, oats, baking soda and salt in a medium bowl. Beat butter, granulated sugar, brown sugar and vanilla in large mixer bowl. Add eggs one at a time, beating well after each addition; gradually beat in flour mixture. Stir in chocolate chips and nuts (nuts are optional). Drop by rounded tablespoon onto ungreased baking sheets. Bake in preheated 375 degree F oven (190 C) for 9 to 11 minutes or until golden brown. Cool on baking sheet 2 to 3 minutes or until cookies are just firm enough to transfer to wire racks. Store tightly sealed to prevent drying.